I released a small free troubleshooting tool back in October 2008 to help diagnose Communicator automatic sign-in issues. It queries all the possible DNS records that Communicator could use to connect to the OCS server, and displays all the associated matches on the client computer. 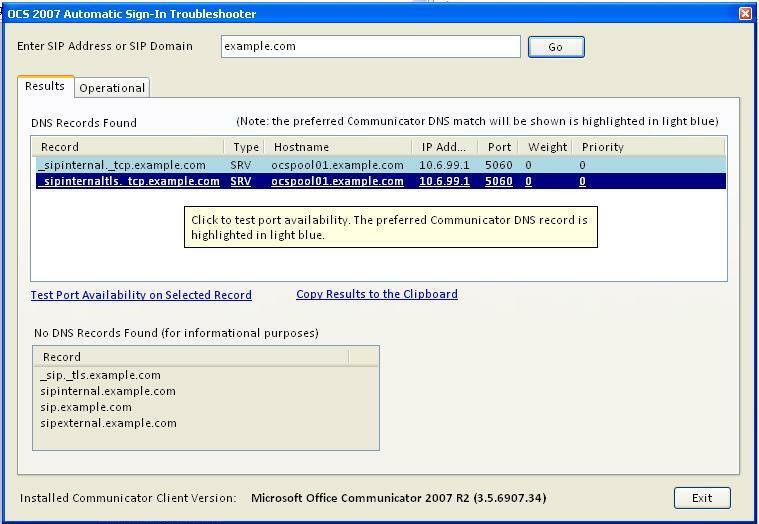 The preferred DNS match (that Communicator will first attempt to use) is highlighted in the results. The type of DNS record that matched (e.g. SRV or A record) is displayed in the results. The availability of the Port associated with any DNS match can be tested with a single-click. Provides a warning if the record being used is TLS and the SIP domain does not match the FQDN of the OCS server/pool. The installed version of the Office Communicator client is shown (if one is installed). This tool is great!!! Thanks!! Thanks. There are lots of improvements to the tool I have queued up. I have seen this behavior once before and I wish I could reproduce it to solve it. Does it happen (the 127.0.0.1) when it is run on a non-DNS server? i.e. regular client workstation? Testing from my DNS server, the tool is showing 127.0.0.1 as the resolution for sip and sipinternal for some reason. dropping to a command prompt proved this was not the case, but I do not know where its getting that from. I hope so . It’s all ‘on-my-spare-time’ which is a challenge. I would like to make some improvements for Lync and add some other features in the next coming months. In regards to the Lync DNS load-balancing, I haven’t tried it in this scenario but the tool resolves the SRV record to an A record using normal DNS resolution, so it should handle DNS load balancing. Have you tried it in this scenario? Will there be a version of this tool for Lync, perhaps handling the DNS load balancing tests? Fantastic little tool! Helped me figure out what was going on with our remote clients.